Merkin Karr fires up the crowd as she speaks during the #MeToo March and Rally on Saturday morning at Buckley Park. Merkin Karr was 19 years old when she found herself in an abusive relationship, but for many years, she refused to believe she was a victim. More than 300 Durangoans on Saturday stood alongside those who have been sexually assaulted, harassed and victimized to say #MeToo and to speak out against such behavior. 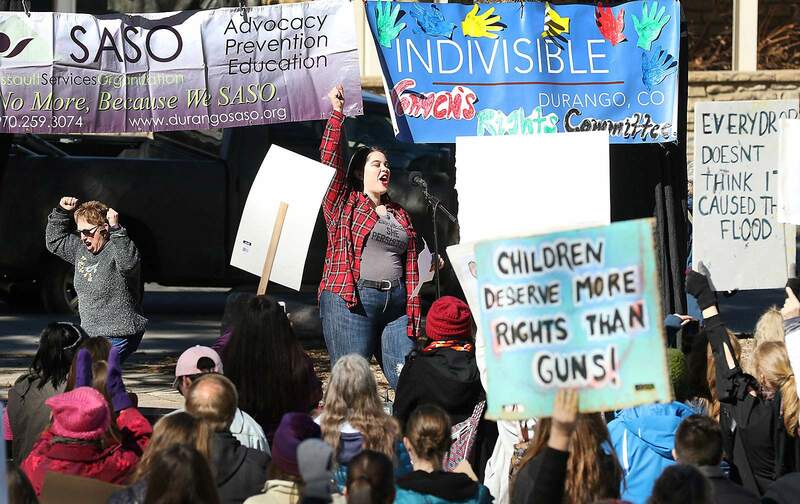 The march was sponsored by the Women’s Rights Committee of Indivisible Durango and co-sponsored by Durango Sexual Assault Services Organization and the Women’s Resource Center. The crowd assembled outside the Durango & Silverton Narrow Gauge Railroad depot, and as they marched along Main Avenue, people chanted phrases like “When we say no, we mean no.” After stopping at Buckley Park, they listened to speeches by Dr. Jude Harrison and Fort Lewis College students Karr and Natalia Sells. Retired Navy Capt. Gail Harris gave opening and closing remarks at the rally. In 1973, Harris became the first woman to serve as an intelligence officer in a Navy combat job. She was also the highest-ranking female African American in the U.S. Navy when she retired in December 2001. Harris spoke publicly for the first time about being sexually assaulted. Rally participant Joanna Atencio said she was stunned and angry after being harassed at her workplace. She believed she was alone in her experience until she reached out to her co-workers. Social activist Tarana Burke created the “me too” phrase in 2006 as part of a campaign to empower women of color and publicize the pervasiveness of sexual assault and harassment. Then, the #MeToo hashtag gained traction on social media in October after more than a dozen women accused Hollywood media mogul Harvey Weinstein of sexual abuse, providing a platform for hundreds of thousands of people to share their experiences of sexual harassment and assault. The #MeToo movement is inclusive. Ryan Garcia, representing Planned Parenthood at the rally, said there is a misconception that the movement is exclusive to women. Marchers said they want to empower change in society without resorting to violence. Some cried during rally speeches, but there was also joy as the crowd danced together in Buckley Park as Christina Aguilera’s song “Fighter” played loudly. Sells shared statistics from the National Congress of American Indians. She said #MeToo has changed lives. According to a 2015 U.S. Transgender Survey, 47 percent of transgender people are sexually assaulted at some point in their lifetime. MeToo march More than 300 people took part in the #MeToo March and Rally on Saturday in Durango to speak out against sexual assault and harassment. More than 300 people took part in the #MeToo March and Rally on Saturday in Durango to speak out against sexual assault and harassment.